On behalf of the U.S. Department of Commerce, Minority Business Development Agency (MBDA) you are invited to join us as we host the National AAPI Business Summit in celebration of Asian Pacific American Heritage Month. 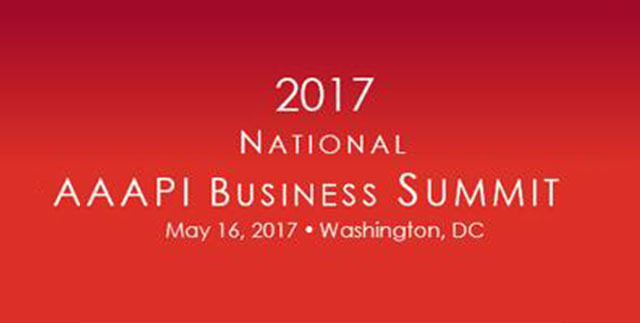 The 2017 National Asian American and Pacific Islander (AAPI) Business Summit is organized by the Minority Business Development Agency in collaboration with the National Asian/Pacific Islander American Chamber of Commerce & Entrepreneurship (National ACE). The purpose of the National AAPI Businesses Summit is to celebrate Asian American & Pacific Islander business success and address issues facing AAPI businesses across the nation in the areas of access to contracts, capital, and global markets. The summit will provide opportunities to hear from successful AAPI business owners, share best practices on collaboration with federal and private corporations, and learn about government services available to support the growth of their businesses. Onsite check-in begins at 8:00 am and a photo ID is required to pass through security. Your name must appear on the security roster to gain entrance.